National Geographic posted a story this week by Victoria Hillman, an explorer who found a pink grasshopper nymph in Transylvania. She asks, "How many of you have seen a pink grasshopper in the wild? I certainly hadn’t and didn’t even know you could have a pink grasshopper, let alone actually see one for real in the wild!" It is called erythrism an unusual and little-understood genetic mutation caused by a recessive gene similar to that which affects albino animals. This mutation results in one of two things happening or even a combination of the two; a reduce or even absence of the normal pigment and/or the excessive production of other pigments, in this case red which results in pink morphs. Although it was first discovered in 1887 in a katydid species, it is extremely rare to see these pink morphs so you can imagine our delight at finding so many in one area and they probably all have the same parents both carrying the recessive gene. So I guess I found one of the original kind. Wonder where they were discovered? May 27, 2007. I got that green thing and put it there just to make the picture more interesting. May 27, 2007: This katydid was easy to photograph. Just hanging out. Not going anywhere. June 2, 2007 Hunted down the first one and it was there too. Is one male and one female? A few weeks later I saw another insect that was kind of a weird color. Not baby pink like this, but more of a coral. This one might always be this color at this stage. I don't know. It was getting dark when I found it but I took its picture anyway. Is it a cicada? What else comes out of a shell like that? It was a lot smaller than the normal cicadas. This was right behind my house on the trail to my pond. I mow it with my Snapper lawn tractor, thus the awful looking chewed up grass blades. I think it's interesting that the eye color on this is similar to the katydids, kind of seafoam green with a black dot. I wish I had a picture of a regular one to compare. All I can find readily is this grasshopper, which is comparable to the nymphs in the National Geographic article maybe. 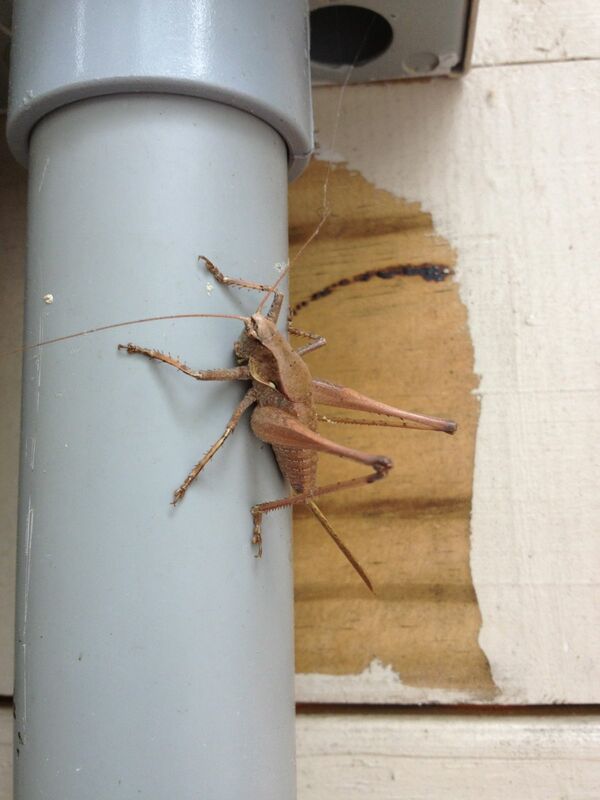 *Update 6/29/2013: I saw a green katydid and a brown something similar. Here's pictures for comparison to the pink ones. I don't know what this is actually. Looks related to a katydid, but kind of different. I gather that grasshoppers and katydids come in color morphs, usually green and brown. When did you start noticing the pinks? COuld it be mutations from radiation? Hey Heisenberg, a snake was here. What kind?